Earlier this year I became pretty excited after discovering the unique online gallery Skull & Heart. I visited their last pop-up at The Print Space and came away with two wonderful prints that now take pride of place in my bedroom. I’ve had a bit of a girl crush on Skull & Heart founder Skye Kelly-Barrett ever since and was intrigued to find out more about her latest projects and hopes for the future. Skull & Heart have just launched a kickstarter campaign to fund their latest project – an art book of their previous all female exhibition. Having already seen the talent included (but obviously not having enough dollar to buy everything) the book will be a welcome addition to my collection. There’s a serious amount of girl power going on within the project and as a female in the art world it makes absolute sense to pledge to this worthwhile project. With all of the fantastic incentives on offer the only trouble should be choosing one but if you need any further persuading, just meet Skye below! Can you tell me a little bit more about Skull & Heart? Skull & Heart is an online & pop-up gallery based in London. We art direct and produce a limited edition screen-print series that is exclusive to S&H, as well as original and print based artwork. What about yourself? What’s your background? My background is in the arts – although it’s more theory based than practical. I studied Art and Design history [BA] and Visual Culture with Exhibition and Museum Design [MA]. Although I have spent most of my time in the fashion industry, I did work occasionally with artists, collectives and galleries during that time period to try and find a position that I could make a career out of instead of unpaid internships. I always knew that the art world was where I wanted to be and eventually I decided that if I was going to work in the field that interested me, with the artists that inspired me, I would have to start something myself – which is what I did and Skull & Heart was born. You have a variety of artists on your roster, all with very unique styles. How do you decide what makes the cut? The Skull & Heart ethos is to engage the public with artists and artwork that they may not have seen before, so I always make a concerted effort to try and have a good mix of emerging and established artists. I always loved the idea of fans from one style of artwork, or artist coming across the work of someone they might never have seen before and purchasing a piece of their work, or even just feeling inspired by that person and following what they do, that’s pretty awesome. In terms of picking artists, I suppose the reality is that all of them are artists whose work I love and want to show the world. 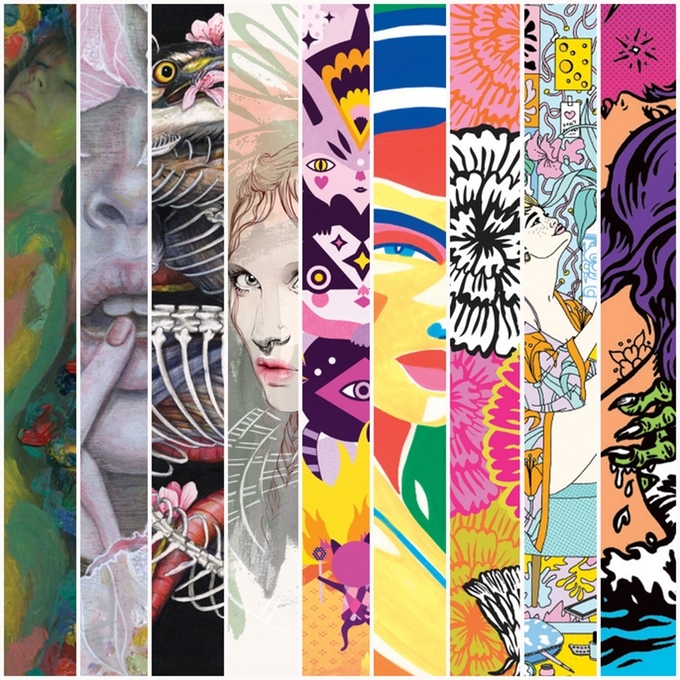 Dealing with a variety of styles is always tough – We do work most prominently within the Lowbrow / Urban / Pop Surrealist / Illustration & Design world, and so we do have an aesthetic style to some extent, but I think we manage to make it feel broader and accessible to art fans of all styles. I love seeing work from new artists, and a few of the ‘Hear Me Roar’ girls were artists whose work I had stumbled upon, or had their work shown to me by chance ages ago – so it’s not really about “making the cut” but more about being the right artists for the right project! However, I will say, having a website is a must and will help me in considering you. 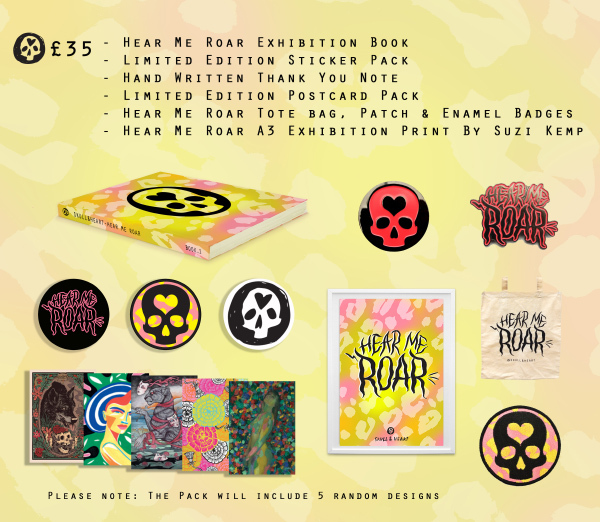 Your last exhibition ‘Hear Me Roar’ was female focused. What was the reasoning behind that? The past projects and exhibitions I had done with S&H had been really ‘male heavy’ and it really bummed me out that I had curated the projects that way. I knew there were so many incredible artists out there, women who were killing it everyday in the business, out-pitching their male counterparts and producing beautiful, ballsy artwork. 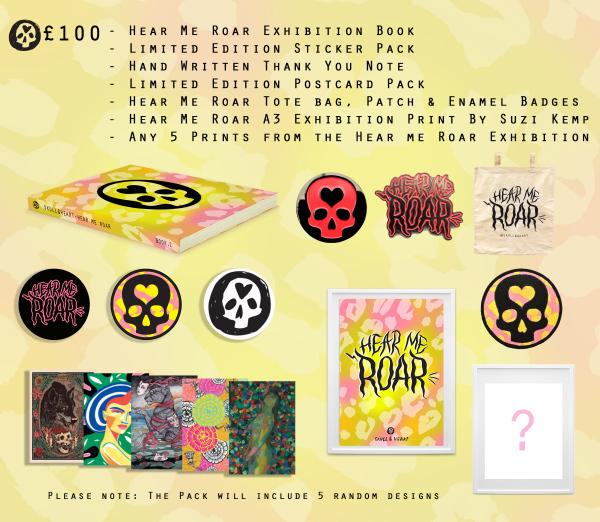 So I thought to myself, “right, if I’m going to do this, it’s going to be big and it’s going to feature the best artists but still stay true to our brand.” So that’s what I did, and 34 artists, 60 pieces later, ‘Hear Me Roar’ was born. You’ve just launched a Kickstarter campaign to create an art book of the exhibition. Why Kickstarter? We had previously used Kickstarter to help us produce our first book which was based on our first ever exhibition and screen print series ‘The Colour Series‘ – During that campaign we found that it’s a really great way to connect with like-minded people who may not already follow us or know about the work that we do! Kickstarter has this really amazing community vibe, were it feels like people really want to help out and see businesses do well with their projects. We have been lucky enough to meet some new customers and fans through our previous projects and hope to meet more with this one! What’s are your hopes for the future and what can we see Skull & Heart doing next? Our biggest hope is to have a permanent space in London – something we are always working on! However, until that is a reality we are currently about to finish the second artist led screen print series “Paradise” which is a black and white series, and we will be celebrating that by having an exhibition early next year (details to be confirmed) – There is talk about a second all-female show, which would be amazing and of course, a third screen print series! Follow Skye and Skull & Heart on instagram here: @skullandheart @skyevkb and give all your money to the project here!